On Sunday night, May 21st, Bridgeway gathered for our most recent Core Gathering. We took this night as an opportunity to celebrate God’s faithfulness to us over the past few months and look forward to what God is leading us to do in the coming years. I thought it might be valuable to summarize a bit of what we talked about. The first item of discussion was the current financial situation. As many of you know, Bridgeway has been carefully watching our funds and praying that God would provide a way to overcome the predicted shortfall. As we shared Sunday night, Bridgeway is operating at a deficit of about $18,000 up to this point in the year. The good news there though, is that we had projected that the deficit would be much greater at this point in the year so we are grateful for God’s faithfulness and your generosity to the church. As was mentioned that night, when broken down, we are short by about $900 a week, and as one of our elders shared, if 30 families would give $30 extra dollars a week, we could cover that deficit. Perhaps you’d like to pray if maybe God would have you do just that? The most exciting part of the evening was the opportunity to share the vision that we believe God has for Bridgeway over the next several months and even over the next few years. Below you can see a grpahic lays out the five-year vision for the church, but let me summarize it this way. By this time next year, we want to be a church of four hundred with eighty new commitments to Christ. Imagine if we could look back a year from now and celebrate what God has done in the lives of these people as they step from darkness to light through the gift of Jesus Christ! 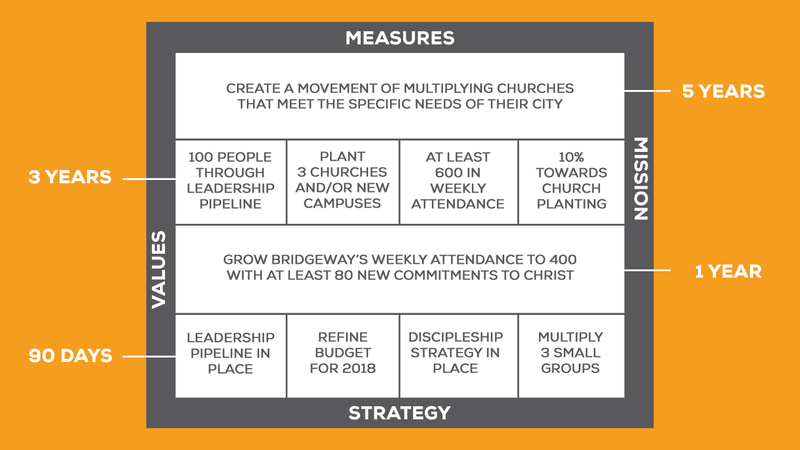 Everything we do over the next year and for the next few years are leading us toward a five-year vision of creating a movement of multiplying churches that meet the needs of their specific community. You will hear us use the word multiplication a lot at Bridgeway. We want it to become a part of our DNA, it is one of our values, and we want to be a part of everything that we do. We don’t want to just plant one or two churches, but we want to multiply churches and multiply churches that multiply churches. Everything that we do as we move forward will be in an effort to help us create a movement of multiplying churches to reach their communities for Christ. You can listen to the full audio, including our Q & A time, from our Core Gathering here. Let me close by saying how grateful I am for the support of the church over the last few months. It has been an easy transition and everyone has played a part in that. I’m grateful to our Board of Elders for the work they’ve done and grateful to our staff, both Josh and Eric. It’s exciting to see what God is doing at Bridgeway and I’m so thankful to be a part of the team. 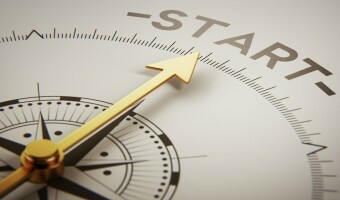 This dream of creating a movement of multiplying churches is a big dream to be sure, but we serve a God who is able to do “exceedingly abundantly beyond all that we ask or imagine.” We are praying that He will do just that and ask that you pray along with us and begin to wrestle with what it is God is leading you to do to help us accomplish this vision. To God be the glory!